Well, I'm super sad to say that this is the last Birchbox for Canada. 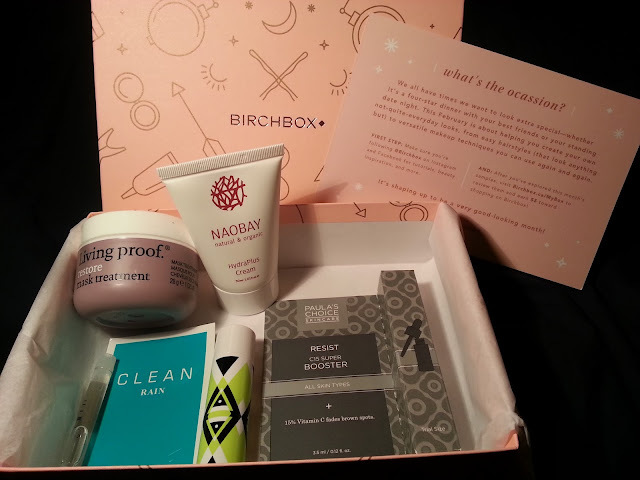 I really enjoyed their boxes, and they were the only subscription service that I was subscribed too. I'll be sad to no longer receive the boxes, and I loved their shop. You could use your points for absolutely anything. I will miss them. First I will start off by saying I was actually prepared this month and took screenshots of the sample choices for this month. And then they had to go and say they were cancelling. Boo. 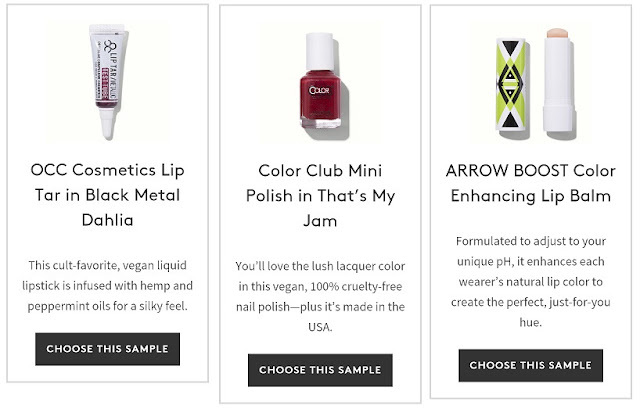 Anyway this months sample choices were OCC Cosmetics Lip Tar in Black Metal Dahlia, Color Club Mini Polish in That's My Jam, and Arrow Boost Color Enhancing Lip Balm. 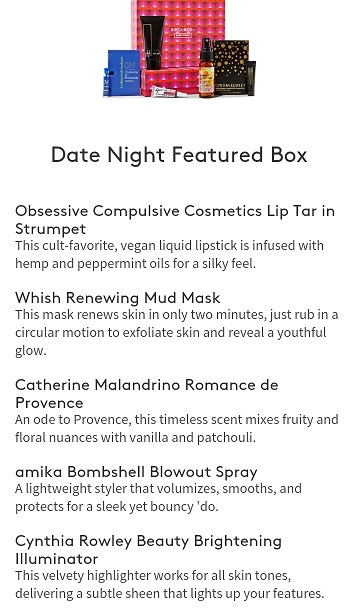 They also released a Date Night Feature Box which included OCC Lip Tar in Strumpet, Whish Renewing Mud Mask, Catherine Maladrino Romance de Provence, Amika Bombshell Blowout Spray, and Cynthia Rowley Beauty Brightening Illuminator. I believe this box also sells for $10, but I never opted in to receive it. When I first saw what was showing in my box, I wasn't too happy. But when I got the actual box, I figured it was a good mixture of products, and I will use everything. I do have to say I love the box. I love that the arrow is becoming more popular, in jewellery and just everything. Arrows are one of the symbols of the Sagittarius zodiac sign (which I am) so it'll be nice to pick some pieces out that reflect a piece of me! I wasn't really looking forward to another hair mask, just because I've received SO many from subscription boxes (especially Birchbox) and I always forget to use them. I mean this will eventually be used, but I'm not in a rush to get to it. Argh. Perfume. I was hoping I'd make it one last box without another fragrance sample. But I guess it was due since I haven't received one in a few months. This one isn't too bad.. they describe it as "the pure scent of a post-downpour world" - this doesn't smell like rain to me. It's kind of citrusy. It's not as bad as I was expecting and I will probably use it up. At first I thought this was a body cream, but according to Birchbox's description, it's for the face. I didn't end up opening this one yet just because I have SO many already opened. 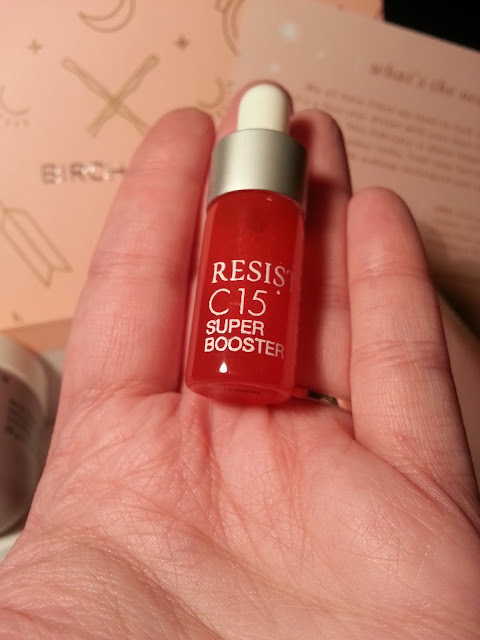 I will probably give a better review of this on it's own, or in an empties post. My sample choice was the Arrow Boost Colour Enhancing Lip Balm. In the packaging it's a sheer peachy colour. 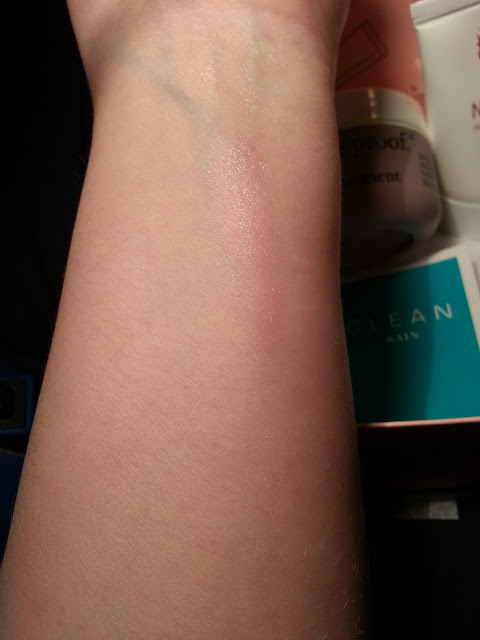 I applied it quickly to my arm to swatch it.. I really like it. It darkened up just a tiny bit on my lips, but left them hydrated and just a tad sparkley. I was tempted to buy it with my points incase I didn't get it, but they have the price as $18, and I definitely wouldn't spend that much on a lip balm. A potent dose of 15% stabilized vitamin C starts working immediately to fade dark spots and leftover acne scars while also quelling redness. Antioxidant vitamin E, ferulic acid, and peptides help repair telltale signs of aging—like wrinkles and slackness—and stimulate collagen production, resulting in a smoother, tighter complexion. Bonus: The nonirritating formula is free of fragrances and dyes, and never tested on animals. How to Use Twice a day, dispense two to three drops into the palm of your hand and smooth over clean face. If you prefer, you can mix it into your moisturizer or serum and apply it that way. In the morning, follow this treatment with a sunscreen rated SPF 15 or higher. Excited to give this a try! The sample is quite small, but I'm sure only using a few drops a day will make this last quite awhile. 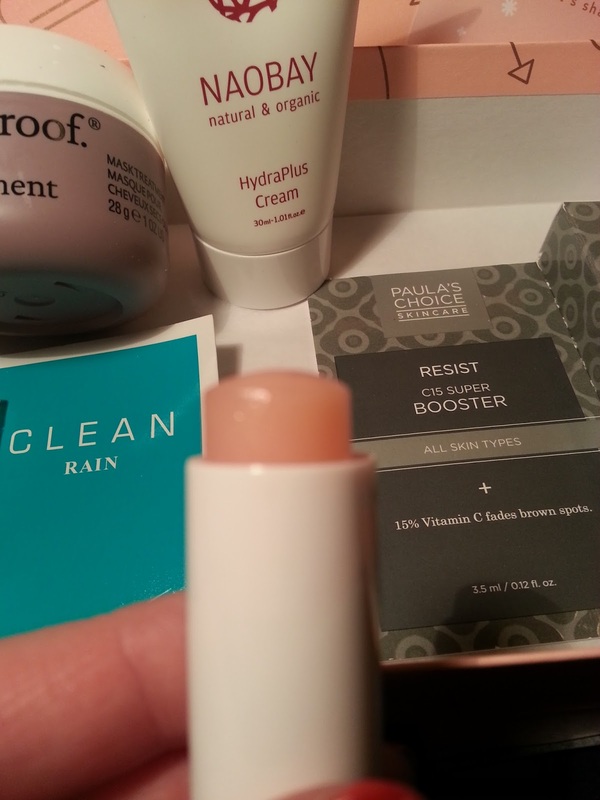 Again, while this probably wasn't my most favourite box ever from Birchbox, there was a good variety of products, I love the lip balm. I will definitely be sad to see them go.